Gaurav Gogoi, who is seeking re-election from the Kaliabor Lok Sabha seat, was addressing a rally in the Upper Assam town of Bokakhat. Congress parliamentarian Gaurav Gogoi on Wednesday said Prime Minister Narendra Modi was a ''chaiwala (Tea-seller)'' in the 2014 general polls and "chowkidar(watchman)" this time but the country will make him "berojgar (unemployed)" after the Lok Sabha election. Gaurav Gogoi, who is seeking re-election from the Kaliabor Lok Sabha seat, was addressing a rally in the Upper Assam town of Bokakhat. He was accompanied by his father and former Assam chief minister Tarun Gogoi and Congress chief Rahul Gandhi. "Narendra Modi was a "chaiwala" (tea seller) in the last election. He is a "chowkidar" (watchman) in this election. Now, people of the country will make him "berojgar" (jobless) after the elections. Only then Modi will understand the plight of jobless youths," Gaurav Gogoi said. Tarun Gogoi, who was campaigning for his son, said people want a visionary prime minister who would "solve their problems and lead the country properly". "We do not want a "chowkidar". We are not thieves or dacoits. 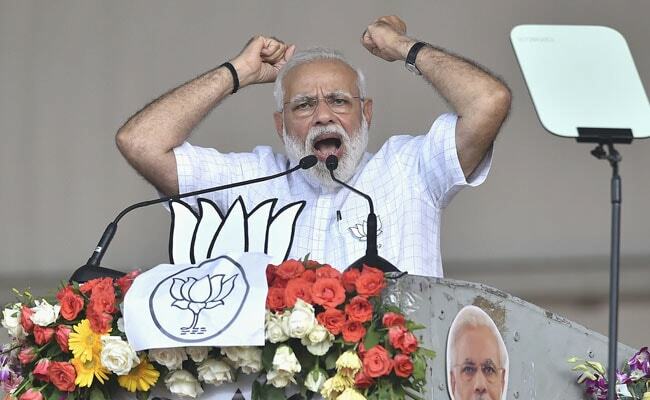 We want a prime minister, a visionary leader, to lead us and solve issues like unemployment of youths and problems faced by women tea garden workers," he said at the rally where Congress president Rahul Gandhi also spoke. Tarun Gogoi also raised questions on the BJP's source of income. "How come the chowkidar's party is so rich? How come BJP president Amit Shah's property rose three times?" he asked. "This chowkidar is a "chor'' (thief)... 'Modi se desh bachao, Rahul Gandhi ko pradhan mantri banao'' (save the country from Modi, make Rahul Gandhi the prime minister)," Tarun Gogoi said. The Congress leader alleged that PM Modi was a "habitual liar" and did not fulfill a single promise made during the 2014 Lok Sabha polls. "The prime minister is a liar. His statements on jobs, ST status to six tribes in Assam, illegal immigration and other issues are all lies. The BJP is spreading only misinformation in the country," Tarun Gogoi said. He claimed that Rahul Gandhi is the only person who thinks about the poor and therefore has announced Rs 72,000 annual income support for 20 per cent of the poorest families in the country. "Not only development, Rahul Gandhi will also work for the protection of the language, culture and identity of Assam. The Congress party took responsibility against the Citizenship Bill and the party chief has promised to abolish it if voted to power," Tarun Gogoi said. He also challenged PM Modi to prove that he has contributed more to the country than former prime ministers Indira Gandhi and Manmohan Singh.